King salmon spend one year as fry in freshwater and anywhere from one to five years in the ocean before returning to spawn. Historically, four-year-ocean fish (fish that have lived in the ocean for four years) have dominated king salmon runs in the Kenai River, accounting for approximately 40 to 60 percent of the returning king salmon. In recent years, the presence of four-year-ocean fish in the Kenai River has declined and the number of two- and three-year-ocean fish has increased. The Kenai River supports major runs of king, sockeye, coho, and pink salmon, but is best known for its king salmon. Kenai River king salmon are highly prized among anglers. 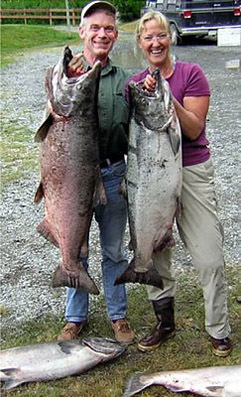 Relative to other king salmon stocks, Kenai River king salmon are large, often weighing more than 40 pounds. The Kenai River king salmon also holds the present world record for the largest sport-caught king salmon—weighing in at 97 pounds. King salmon runs begin in mid-May and overlap with sockeye salmon runs, which begin to arrive in late May, and coho and pink salmon runs which begin arriving in mid to late July. At the Kenai River - River Mile (RM) 14 sonar site, ADF&G monitors the river’s early and late king salmon runs. The dividing line between early and late king salmon runs is roughly July 1. Early-run king salmon spawn primarily in larger tributaries of the Kenai River, such as the Funny and Killey rivers, while late-run king salmon spawn mostly within the Kenai River mainstem. An estimated 20 to 40 percent of late run king salmon spawn between RM 10 and the Soldotna Bridge at RM 21. Many more king salmon arrive in the late run than the early run. Based on historical (1986-2014) estimate data, an average of approximately 8,000 early run and 35,500 late run king salmon have escaped to spawn annually. Kenai king salmon support one of the most heavily fished and intensively managed sport fisheries in Alaska. Early-run king salmon are caught primarily by sport anglers and late-run king salmon are caught by commercial, sport, subsistence and personal use fisheries. For early-run king salmon greater than or equal to 34 inches total length as measured by Adaptive Resolution Imaging Sonar (ARIS), the Sustainable Escapement Goal is 2,800 to 5,600 and the Optimal Escapement Goal is 3,900 to 6,600. For late-run king salmon 34 inches or longer, the Sustainable Escapement Goal is 13,500 to 27,000.